Tooth decay is still one of the most common chronic childhood diseases in the world, even though preventive measures have been developed, tested and applied during the last five decades. Moreover, a rising prevalence of early childhood caries has been reported it has turned from a wealth-related disease into a disease of poverty. Within the prevention methods, dental sealants are still underused even though their efficacy is well documented. The aim of this review is to highlight practice guidelines for the correct use of sealants. The clinician should know which patients need dental sealants and when, in particular high risk subjects and pre-school children. Dentists should also be able to determine the best choice between the different sealant materials of the two main categories, resin-based and glass ionomer sealants, with regard to their different properties, such as caries’ preventive effect, fluoride release and retention rate. Several dental resin-based materials, including resin-based dental sealants, contain the monomer bisphenol A diglycidylether methacrylate (Bis-GMA), of which Bisphenol A (BPA) is a component. The controversy about the possible toxicity of this synthetic chemical resin used to produce plastic products is long debated and, even if the amount of BPA released by dental sealants is well below the limit proposed by the U.S. Environmental Protection Agency and the European Food Safety Authority, the risk of exposure, particularly for children, can be further reduces by following precautionary measures. Dental sealants play an important role in preventing the onset and the development of dental cavities Even if the “fluoride-releasing resin sealants” are better than “glass ionomer”, with regards to retention of the material, the literature shows that their effectiveness in preventing fissure caries in permanent molars does not differ significantly over 24 months. Caries prevalence; Caries prevention; Pit and fissure sealants; Dental sealants; High-risk caries; Primary oral health care; Resin-based sealant. Dental caries is the most prevalent condition recorded in permanent teeth by the GBD 2010 Study (global prevalence of 35%) (Marcenes et al., 2013), especially in children: notwithstanding its decrease over the last decades, it is still the 10th most prevalent health condition in children worldwide. In 2010, 2.4 billion people in the world had untreated cavitated dentine carious lesions in permanent teeth, and untreated cavitated dentine carious lesions in deciduous teeth affected 621 million children worldwide (Frencken, 2017). Actually, in the young subjects a higher caries burden is reported (Splieth et el., 2016), particularly in the first 5-6 years of the primary dentition more than in the first 6 years of the permanent one [Bolin, 1997]. This is confirmed by the lower decline of decay recorded for the primary dentition (35%) than for the young permanent dentition (70%) [Deutsche Arbeitsgemeinschaft für Jugendzahnpflege, 2010], whereas in adult subjects caries reduction ranges from 18 to 66% [Menghini et al., 2001; Marthaler, 2004]. In a review by Do , who analyzed the caries experience of 12-year-olds in 43 countries from pre-1980 to 2010, the decrease did not include children of lower socioeconomic status or from lower developed countries, thus highlighting that caries has turned from a wealth-related disease into a disease of poverty. The prevalence data provided by the World Health Organization confirm this hypothesis, showing a lower dmft/DMFT in the high-income group, compared to the middle-income group (Frencken, 2017). Dental caries is related to individual hygiene and dietary factors, which in turn are connected to the socio-economic status of the subject (education level, employment, etc.). This is confirmed by the rising prevalence of early childhood caries [Jin et al., 2003; Postma et al., 2008; Treuner and Splieth, 2013], which in developed countries is in fact linked to low socio-economic status [Psoter et al., 2006]. For USA parents children’s dental health has a lower priority than school safety, nutrition and the upcoming cold and flu season, though more than 51 million school hours are missed each year due to dental-related illness [The Ad Council’s survey, September 2014]; moreover, 1.75% of parents report that their children sometimes or frequently forget to brush their teeth. In Europe, tooth decay in 5-6-year-old children rages from 20% to 90%, depending on socio-economic determinants (WHO, 2016), oral health problems and access to primary oral healthcare. That is why the “Europe/WHO 2020 goal” of reaching a caries-free value of 80% in both 4- and 12-year-olds is a long way off. Education and prevention programs for children and parents at all socio-economic levels are the only means to avoid dental cavities (Colombo and Paglia, 2018). Dentists and oral healthcare providers are therefore called to give priority to prevention and oral health promotion, particularly in early childhood, and implement risk management strategies. Primary prevention consists of advice and intervention to prevent caries onset, such as encouraging less consumption of sugar, whereas secondary prevention focuses on the detection and management of early caries and cavitation (Colombo and Paglia, 2018). Fluoride varnishes are the first recommended tool for caries prevention in subjects at risk of developing tooth decay: 2.26 percent fluoride varnish (for children younger than 6 years) or 1.23 percent fluoride (acidulated phosphate fluoride) gel, 2.26 percent fluoride varnish; Home oral care should include 0.05 percent fluoride gel or paste or 0.09 percent fluoride mouthrinse for patients 6 years or older (Weyant, 2013). Dental sealants are crucial in preventing the onset and the development of dental cavities. They act as a primary prevention barrier against plaque and acids, by forming a shield on the occlusal surface of teeth. Pits and fissures of the occlusal surfaces of posterior teeth are in fact are eight times more susceptible to caries than smooth surfaces (they account for 80% to 90% of the total caries in permanent teeth and about 44% in primary teeth) [Athira et al., 2017]. Sealants are also effective in secondary preventive approach inhibiting caries progression on early non-cavitated carious lesions [Holmgren, 2014]. Wright  reported that the risk of developing new carious lesions in primary or permanent molars decreased by 76% in children or adolescents who received sealants in sound occlusal surfaces or non-cavitated pit and fissure carious lesions, compared with an unsealed control group after two years of follow up. Even after 7 or more years of follow-up, the caries incidence was about 29% in the experimental group, compared to a caries incidence of 74% in the control group. However, sealants are still underused even if clinical practice guidelines are widely available [AAPD, 2016; Ferrazzano et al., 2016]. Newly erupted teeth have a high caries susceptibility as enamel is not completely formed and therefore the eruption of the first primary molar and of the first and second permanent molars represent the right time to apply sealants. As for primary teeth, evidence supporting the use of sealants is not strong, as there is a lower presence of pit-and-fissure caries in primary than in permanent teeth (44% vs. 90%) [Dye et al., 2007]. The Cochrane Systematic Review underscores that the effectiveness of sealants is clear for children with high caries risk, and less for those with lower risk [Ahovuo-Saloranta et al., 2013]. The American Academy of Pediatric Dentistry suggest to target prevention strategies based on patient’s risk and recommends the inclusion of sealants in a comprehensive caries prevention program for children over 3 years of age. Guidelines of the Italian Society of Paediatric Dentistry (SIOI) recommend applying sealants (and fluoride varnishes, gel and mouthwash) only to high-risk patients over 7 years of age [SIOI, 2013]. The Guideline of the Italian Ministry of Health for oral health promotion in children provides clinical protocols for caries risk assessment , through the experience of caries, eating habits, oral hygiene, fluoride prophylaxis, general health status of the subject and socio-economic background of the family (Strength of recommendations A; Quality of evidence I). It should not be neglected that patients wearing an intraoral appliance are considered moderately at risk of developing caries [AAPD, 2013] and therefore dental sealants are suggested. In the case of teeth affected by molar-incisor hypomineralization (MIH), fissure sealants may be useful before breakdown occurs, especially when teeth are fully erupted and when moisture control is adequate. Regular checkups are paramount. Sealants can be used on non-cavitated carious lesions to inhibit their progression by decreasing the number of viable bacteria [Wright et al., 2016]. Hence, the Bodecker’s concept “when in doubt seal” rather than “when in doubt fill”. In other words, sealants do not replace the other preventive interventions, namely daily brushing and healthy diet, but they are part of a comprehensive prevention program and their use should be encouraged, especially in patients at high-risk of developing caries. Sealants offer 100% caries prevention on the surface as long as they are retained: retention rate is initially about 85%-100%, dropping to about 50% after five years; therefore it is recommended to replace sealants after 5 years. Before choosing the material some crucial points should be analyzed. Will the sealant have the appropriate preventive effect on caries? How easy is it to use/apply? Resin-based sealants can be classified according to their method of polymerization, viscosity (Reddy et al., 2015) and translucency [Simonsen et al., 2002]. Placement procedure starts with pits and fissures cleaning, acid etching and maintaining a dry field until the sealant is placed and cured [Beauchamp et al., 2008]; the literature suggests supplemental techniques, such as the use of bonding agents, rather than mechanical enamel preparation [Ferrazzano et al., 2017]. Eventually, retention should be checked with a probe after polymerization to assess effective sealing. Conventional glass ionomer sealants are generally easier to place than resin-based ones, as they do not need tooth processing before application (enamel and dentin are bond through a chemical reaction) [AAPD, 2016] and are not susceptible to moisture. Moreover, they continuously release fluoride (until the material remains on the tooth), although the clinical effect is not well established. The main liability of this material is retention: glass ionomer sealants have lower retention rates compared to resin-based ones [Forss 1998; Karlzén-Reuterving, 1995; Kervanto-Seppälä, 2008; Poulsen, 2001]: at 36–48-month follow-up, the average retention rate for the resin-based sealants was 76%, while, for the glass ionomers it was only 8% (based on five studies with these follow-up times). For these reasons, glass ionomer sealants may be used as a temporary preventive agent when concerns about moisture control may compromise the placement of Resin-based sealants, as in the case of partially erupted permanent teeth [Dean et al., 2016]. In resin-modified glass ionomer sealants resin is incorporated with glass ionomer, in order to improve physical characteristics of the material [Pinkham et al., 20059, which shows less sensitivity to water and a longer working time than conventional glass ionomer [AAPD, 2016]. They set by means of an acid base reaction and partly via a photo-chemical polymerisation reaction. Polyacid-modified resin sealants, also referred to as compomers, combine resin-based material in traditional resin-based sealants with the fluoride-release and adhesive properties of glass ionomer sealants; i.e., they do not contain water, are hydrophobic and can be polymerized after positioning the bonding agents, and release fluoride, though in much smaller amounts. Several studies [Amin et al., 2008; Antonson et al., 2012; Guler et al., 2013] have found no statistically significant difference in the preventive effect of resin-based and glass ionomer sealants at 24, 36, and 48 months. For this reason, glass ionomer sealant can be also a valid alternative where and when resin sealant placement is not possible. Bisphenol A: a real threat? Bisphenol A (BPA) is a synthetic chemical resin used to produce plastic food-storage containers; at very low levels, it has been detected in human blood and tissues. BPA is also a component of the bisphenol A diglycidylether methacrylate (Bis-GMA), which is a monomer used for production of dental resin-based materials, including sealants through its derivatives Bis-GMA and Bis-DMA. BPA can act as an endocrine disruptor by binding to estrogen receptors as well as blocking the estrogenic response by competing with endogenous E2 [Bailin et al., 2008; Viñas et al., 2012]. Furthermore, it can bind to thyroid receptors and influence thyroid functions thanks to its agonistic and antagonistic effects. It can also interact with the immune system and the developing central nervous system [Wetherill et al., 2007] and may elicit a non monotonic dose response and the response may be greater at low doses [Vandenberg et al., 2012]. The hypothesis that the BPA could have a non monotonic dose-response curve has raised concerns and, in 2012, it was decided to lower the tolerable daily intake (TDI) from 50 ug/kg bw/day, established in 2006 by the EFSA, to 5 ug/kg bw/day [Bakker et al., 2014]. Several studies report that perinatal and early life exposure to BPA can have harmful multisystemic effects [Hong et al., 2017; Rebuli et al., 2014]. The most vulnerable subjects are infants and children for whom the lowest observed-adverse-effect level dose is lower than 5 ug/kg bw/day. The ADA Science Institute tested the BPA release from 12 dental sealants, which resulted to be very low (about 0.09 nanograms/day) and well below the limit proposed for a 6-year-old child (considering an average weigh of about 20 kg/44 pounds) by the US Environmental Protection Agency (1 million nanograms per day) and the European Food Safety Authority (80,000 nanograms per day). Trace molecules can be found due to degradation, incomplete polymerization or impurity deriving from the manufacturing process. Moreover, BPA can also be released by resin-based materials because of the enzymatic salivary hydrolysis of BPA derivatives, such as the bis-GMA or the bis-DMA [Rathee et al., 2012]. In a study by McKinney et al. , despite the fact that children who had dental sealants had a BPA concentration 20% to 25% higher than children with no dental sealants, there was no statistically significant association between the number of resin-based sealants and urinary BPA concentrations. There is a number of reports on BPA exposure and adverse perinatal development. Molar Incisor Hypomineralization is a recently reported condition which affects the first molars and the permanent incisors. Randomly scattered white opacities are present on the enamel and a variable prevalence of 2.4% to 40% is reported in children aged 6 to 8 years. Although there are different possible causes for this condition, an association with postnatal BPA exposure has been made and is possibly related to the fact that ameloblasts are susceptible to it. 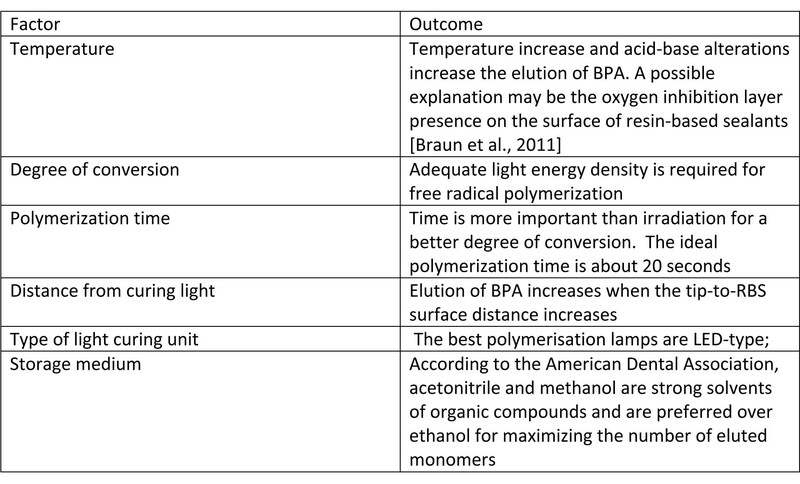 Factors affecting the elution of BPA are summed up in table 1. Ultimately, BPA exposure from dental materials seems transient and can be controlled and reduced, particularly for children, by following precautionary measures during the application of resin-based sealants, since the higher risk for potential exposure occurs immediately after application (Colombo et al., 2018). Removal of residual monomer by rubbing the monomer layer with pumice on a cotton roll. rinsing with an air-water syringe when proper rinsing and spitting can be challenging. Correct use of a rubber dam to protect the operative field. If on the one hand there is strong evidence that resin-based dental sealants improve children’s oral health, on the other hand the possible toxicity of BPA has raised many concerns; however, most studies report that in vitro and in vivo BPA levels related to dental sealants are well below the limit proposed by the U.S. Environmental Protection Agency and the European Food Safety Authority. Also the debate if the “fluoride-releasing resin sealants” are better than “glass ionomer”, with regards to retention of the material, has been settled by the literature showing that their effectiveness in preventing fissure caries in permanent molars does not differ significantly over 24 months. It should never be forgotten that dental sealants play an important role in preventing the onset and the development of dental cavities and dental practitioners should be knowledgeable on their correct and timely application, and reduce the risk of exposing their patients to potentially hazardous chemicals, particularly children. Clinicians are also called to respond in a reliable and documented way to parents’ concerns. Center for Scientific Information, ADA Science Institute. Caries Risk Assessment and Management. Reviewed by: Caries Workgroup, ADA Council on Scientific Affairs. Topic last updated: December 14, 2018 (https://www.ada.org/en/member-center/oral-health-topics/caries-risk-assessment-and-management). Marcenes W, Kassebaum NJ, Bernabé E, Flaxman A, Naghavi M, Lopez A, Murray CJ. Global burden of oral conditions in 1990-2010: a systematic analysis. J Dent Res. 2013 Jul;92(7):592-7. Do L. Distribution of caries in children. Variations between and within populations. J Dent Res 2012;6:536-543. Splieth CH, Christiansen J, Foster Page LA. Caries epidemiology and community dentistry: chances for future improvements in caries risk groups. Outcomes of the ORCA Saturday Afternoon Symposium, Greifswald, 2014. Part 1. Caries Res 2016;50:9-16. Bolin AK. Children's dental health in Europe. An epidemiological investigation of 5- and 12-year-old children from eight EU countries. Swed Dent J Suppl 1997;122:1-88. DAJ (Deutsche Arbeitsgemeinschaft für Jugendzahnpflege): Epidemiologische Begleituntersuchungen zur Gruppenprophylaxe 2009. Bonn, DAJ, 2010. Menghini GD, Steiner M, Leiseback T, Weber RM: 2001: Rückang der Kariespravalenz bei Schweizer Rekruten von 1970-1996. Schweiz Monatsschr Zahnmed 2001;111:410-416. Marthaler TM: Changes in dental caries 1953-2003. Caries Res 2004;38:173-181. Jin BH, Ma DS, Moon HS, Paik DI, Hahn SH, Horowitz AM. Early childhood caries: prevalence and risk factors in Seoul, Korea. J Public Health Dent 2003;63:183-188. Postma TC, Ayo-Yusuf OA, van Wyk PS. Socio-demographic correlates of early childhood caries prevalence and severity in a developing country - South Africa. Int Dent J 2008;58:91-97. Treuner A, Splieth CH. Frühkindliche Karies - Fakten und Prävention. Zahnarztl Mitt 2013;17:44-50. Psoter WJ, Pendrys DG, Morse DE, Zhang H, Mayne ST. Associations of ethnicity/race and socioeconomic status with early childhood caries patterns. J Publ Health Dent 2006; 66(1): 23-29. The Ad Council’s survey was conducted by LightSpeed Research in September 2014. The nationally representative online survey included 600 parents with children 0‐12. Frencken JE, Sharma P, Stenhouse L, Green D, Laverty D, Dietrich T. Global epidemiology of dental caries and severe periodontitis - a comprehensive review. J Clin Periodontol 2017 Mar;44 Suppl 18:S94-S105. WHO, 21th Congress of the European Association of Dental Public Health, October 2016. Weyant RJ. Topical fluoride for caries prevention. JADA 2013 November; 144 (11): 1279–1291. Athira S, Shamaz M. Sealants, Pit and fissure StatPearls [Internet]. Treasure Island (FL): StatPearls Publishing; 2018 Jan-2017 Oct 5. Holmgren C, Gaucher C, Decerle N, Doméjean S. Minimal intervention dentistry II: part 3. Management of non-cavitated (initial) occlusal caries lesions--non-invasive approaches through remineralisation and therapeutic sealants. Br Dent J 2014 Mar;216(5):237-43. Wright JT, Tampi MP, Graham L, Estrich C, Crall JJ, Fontana M, Gillette EJ, Nový BB, Dhar V, Donly K, Hewlett ER, Quinonez RB, Chaffin J, Crespin M, Iafolla T, Siegal MD, Carrasco-Labra A. Sealants for preventing and arresting pit-and-fissure occlusal caries in primary and permanent molars. Pediatr Dent 2016;38(4):282-308. Ferrazzano GF, Sangianantoni G, Cantile T, Ingenito A. Relationship between social and behavioural factors and caries experience in schoolchildren in Italy. Oral Health Prev Dent 2016;14(1):55-61. Dye BA et al. Trends in oral health status: United States, 1988-1994 and 1999-2004. Vital Health Stat 2007; 11(248): 1-92. Ahovuo-Saloranta A, Forss H, Walsh T, Nordblad A, Mäkelä M, Worthington HV. Pit and fissure sealants for preventing dental decay in permanent teeth. Cochrane Database Syst Rev 2017 Jul 31;7:CD001830. Review. Reddy VR, Chowdhary N, Mukunda K, Kiran N, Kavyarani B, Pradeep M. Retention of resin-based filled and unfilled pit and fissure sealants: A comparative clinical study. Contemp Clin Dent 2015;6: S18–S23. Dean JA. McDonald and Avery’s Dentistry for the Child and Adolescent. 10th ed. Elsevier Health Sciences: Amsterdam; 2016. Beauchamp J, Caufield PW, Crall JJ, Donly K, Feigal R, Gooch B, Ismail A, Frantsve-Hawley J. Evidence-based clinical recommendations for the use of pit-and-fissure sealants: A report of the American Dental Association Council on Scientific Affairs. J American Dental Association 2008; 139(3): 257-68. Ferrazzano GF, Ingenito A, Alcidi B, Sangianantoni G, Schiavone MG, Cantile T. In vitro performance of ultrasound enamel preparation compared with classical bur preparation on pit and fissure sealing. Eur J Paediatr Dent 2017 Dec;18(4):263-267. doi: 10.23804/ejpd.2017.18.04.01. Forss H, Saarni UM, Seppä L. Comparison of glass‐ionomer and resin‐based fissure sealants: a 2‐year clinical trial. Community Dentistry and Oral Epidemiology 1994;22(1):21‐4. Karlzén-Reuterving G, van Dijken JW. A three-year follow-up of glass ionomer cement and resin fissure sealants. ASDC J Dent Child 1995 Mar-Apr;62(2):108-10. Kervanto-Seppälä S, Lavonius E, Pietilä I, Pitkäniemi J, Meurman JH, Kerosuo E. Comparing the caries-preventive effect of two fissure sealing modalities in public health care: a single application of glass ionomer and a routine resin-based sealant programme. A randomized split-mouth clinical trial. Int J Paediatr Dent 2008 Jan;18(1):56-61. Poulsen S, Beiruti N, Sadat N. A comparison of retention and the effect on caries of fissure sealing with a glass-ionomer and a resin-based sealant. Community Dent Oral Epidemiol 2001 Aug;29(4):298-301. Bailin PD, Byrne M, Lewis S, Liroff R. Public awareness drives market for safer alternatives: bisphenol A market analysis report. Investor Environ Health Network 2008; 15: 1-37. Viñas R, Jeng YJ, Watson CS. Non-genomic effects of xenoestrogen mixtures. Int J Environ Res Public Health 2012; 9: 2694-2714. Vandenberg LN, Colborn T, Hayes TB, Heindel JJ, Jacobs DR Jr, et al. Hormones and endocrine-disrupting chemicals: low-dose effects and nonmonotonic dose responses. Endocr Rev 2012; 33: 378-455. Bakker J, te Biesenbeek JD, Boon PE, Bos P, van Broekhuizen FA. Bisphenol A: Part 1. Facts and figures on human and environmental health issues and regulatory perspectives. 2014. Hong YP, Yang YJ. Low-Dose Exposure to Bisphenol A in Early Life. InBisphenol An Exposure and Health Risks 2017. InTech 2017. Rebuli ME, Cao J, Sluzas E, Delclos KB, Camacho L, et al. Investigation of the effects of subchronic low dose oral exposure to bisphenol A (BPA) and ethinyl estradiol (EE) on estrogen receptor expression in the juvenile and adult female rat hypothalamus. Toxicol Sci 2014; 140: 190-203. Rathee M, Malik P, Singh J. Bisphenol A in dental sealants and its estrogen like effect. Indian J Endocrinol Metab 2012; 16: 339. McKinney C, Rue T, Sathyanarayana S, Martin M, Seminario AL, et al. Dental sealants and restorations and urinary bisphenol A concentrations in children in the 2003-2004 National Health and Nutrition Examination Survey. J Am Dent Assoc 2014; 145: 745-750. Colombo S, Beretta M, Ferrazzano GF, Paglia L. Dental Sealants Part 4: Bisphenol A: What dentists should know. Eur J Paediatr Dent 2018 Dec;19(4):333-334.